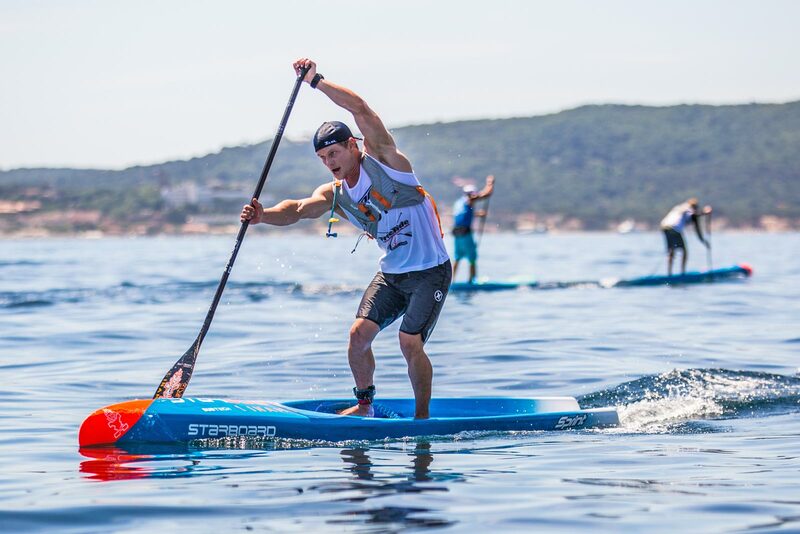 Australia’s Michael Booth has proven yet again that he’s the strongest distance race paddler on the planet, overpowering world number one Connor Baxter and Carolina Cup champion Titouan Puyo to claim the 18km event on day 2 here in St. Maxime, France, earning the overall ‘SUP Race Cup’ title and gaining an early advantage on the EuroTour Leaderboard in the process. With beautiful blue skies and flat, glassy conditions greeting the assembled field of international stars, European dark horses and local contenders this morning (which stood in stark contrast to the cyclonic winds in Saturday’s beach race), this was always going to be Boothy’s type of race. It was 12 months ago this weekend that the Starboard rider announced himself as the strongest distance racer in the world, and after a few disappointing results early in season 2017 he was clearly keen to reassert his dominance. After the field bunched into a tight draft train over the opening few kilometres, Boothy started testing the field by making surges at the front before deciding to sit back in the top 10 pack and wait for a more opportune time to strike. That would eventually come as the lead pack rounded the small, rocky outcrop in the far reaches of the course, at which point there were some bumps from distant megayachts that allowed the stronger paddlers to break free. Boothy, Connor, Titou and Leo broke away from the rest of the contenders, which included an impressive Slater Trout, his Infinity team mate Giorgio Gomez (who closed the gap on the lead pack after a bad start), Trevor Tunnington, Paolo Marconi, early race leader Bruno Hasulyo and Boris Jinvresse. Slightly further back was Arthur Arutkin in an 11th-placed no man’s land, and the Raging Bull from Tahiti, Georges Cronsteadt, who was forced to work his way back through the field after a horror start saw him as far back as 35th at one stage. As the race entered its closing stages, Boothy took a solo line closer to the coast in order to find his own clean water, which setup a parallel contest for the virtual race lead between the world number two and the other three contenders that had stayed out wider–Boothy was clearly hedging his bets that he could out-paddle his rivals to the next buoy, even if it meant perhaps taking a marginally longer route. 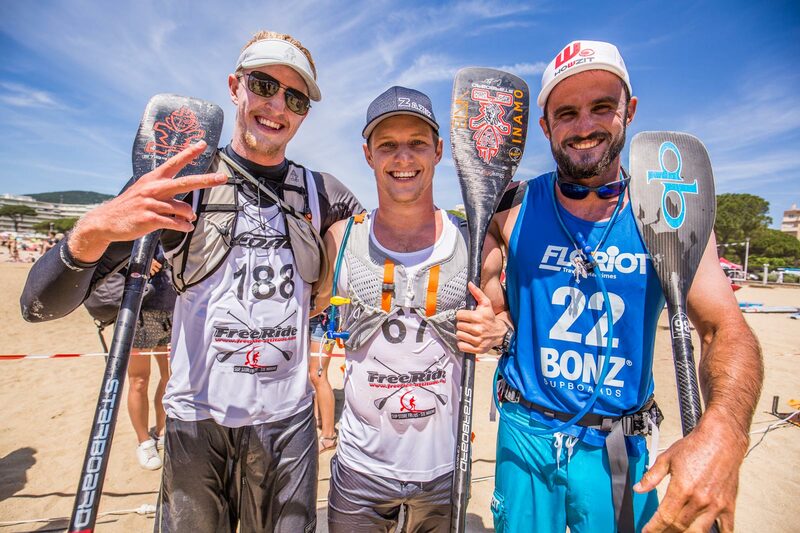 When the contenders came back to the same line the Aussie’s strength quickly became apparent: In less than a kilometre, Boothy had gapped Connor, Titou and Leo by at least 100 metres and was pulling further ahead with every stroke, which virtually sealed the fate of the overall event title despite the fact there was still 1.5kms til the finish. At that point it became a strategic race between Connor and Titou, who were only separated by 4 seconds on the overall event leaderboard after their near-photo finish yesterday. Titou wisely started playing defense by sitting on Connor’s tail and guarding his slight time advantage rather than blowing an engine trying to reel in the unstoppable leader. The race would stay this way all the way to the line, with Boothy eventually opening up a gap of almost two minutes as he refused to take his foot off the pedal despite having sealed the victory. He needed to make up just 12 and 16 seconds on Connor and Titou respectively, but in the end the overall time gap was about 90 seconds as Boothy showed that when variables such as wind and buoy turns are taken out of the equation he’s virtually impossible to match in a head-to-head paddling contest. After the runaway leader crossed the line triumphantly, the attention immediately turned to Connor and Titou’s battle for the overall runner-up spot, with the pair sprinting to the line in a desperate fight over the four second gap that the Frenchman carried into today’s race. In the end, Connor fell agonisingly short, crossing just 2.7 seconds ahead of his rival. That margin meant Titou held onto 2nd place for the weekend, while it also highlighted that combining times within an event (and combining races within an event, period) probably isn’t the best way to go about it. Leo crossed close behind Titou and Connor in 4th, while Slater, who’s shown vintage form here in France this weekend, claimed 5th for the second day in a row for Team Infinity. Slater’s strong pre-season training regime is clearly paying dividents, with the Infinity Speed Freak winding back the clock to the days when he was a permanent podium fixture. After finishing with a pair of fifths but having different guys in 4th place each day (Bruno Hasulyo on Saturday and Leo Nika today), the Californian actually jumps up to 4th place on the overall event standings, a fantastic result for the Infinity crew that have sent virtually a full team here to Europe. Another Infinity Speed Freak in Giorgio Gomez was just a second behind at the line, while Paolo Marconi took 7th for Team RRD and Trevor Tunnington added another Starboard to the top 10 by finishing 8th. Georges Cronsteadt continued his ‘tale of two races’ to sneak inside the top 10 ahead of Frenchman Boris Jinvresse. If you take out his horror opening kilometre, Georges would have been one of the fastest paddlers in the race. Meanwhile in the women’s race, Sonni Honscheid made no doubt about the overall SUP Race Cup title by making it a clean sweep of the weekend. After winning yesterday’s wind-blown beach race by over two minutes, Sonni once again broke the field early and pulled away to make it a double event victory for Team Starboard. The German powerhouse was simply in a league of her own this weekend, and showed the type of form that suggests she’ll be hard to stop en route to a third-straight EuroTour title. In fact, on the incredible form she showed yesterday and today, I think it would have been a great battle between Annabel and Sonni this weekend, though we’ll have to wait until Molokai in two months’ time to for that duel to be settled. 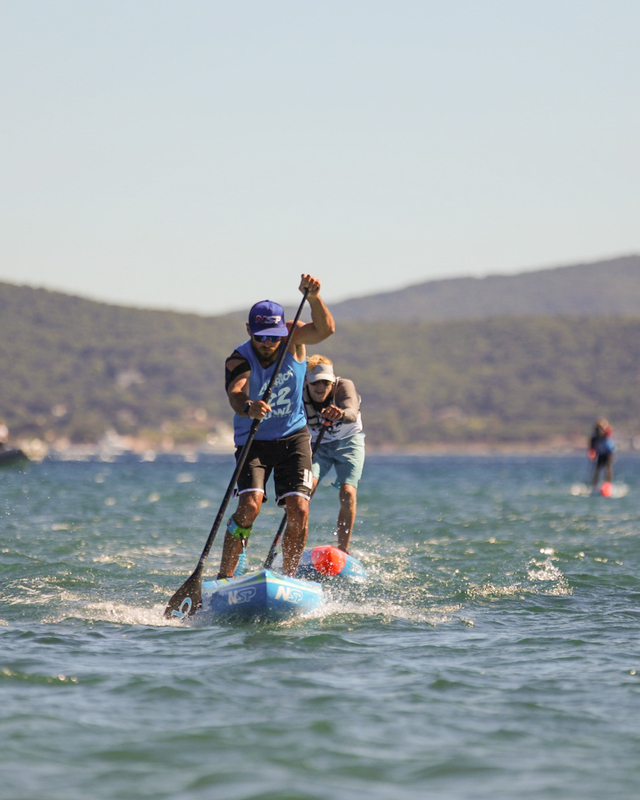 Once again Sonni’s blue-board team mate, Frenchwoman Olivia Piana, was the only one that could stay within shouting distance, sticking with the Molokai champion over the first kilometre and remaining within a couple of hundred metres all the way through the 18km course around the Gulf of St. Tropez. Olivia takes a pair of 2nd place finishes this weekend to secure a well-deserved overall runner-up and cement her position as the most under-rated women in the world of stand up paddling. Olivia’s result this weekend follows her 3rd place at Carolina, a pair of silver medals at The Worlds in Fiji and a 4th at the Pacific Paddle Games. After missing the 2015 season, Olivia has come back stronger than ever over the past 12 months and will now start as a clear podium favourite in every race she enters. Olivia’s strong finish also made it a 1-2 finish for Team Starboard, with the blue board entourage rolling deep here on the EuroTour once again this year. But not to be outdone by the powerhouse brad, Candice Appleby secured third place overall for Team Infinity after putting on a strategic display of racing today. With the men and women starting together today, Candice was caught out in the mid-packs of the men and lost touch with Sonni and Olivia early. 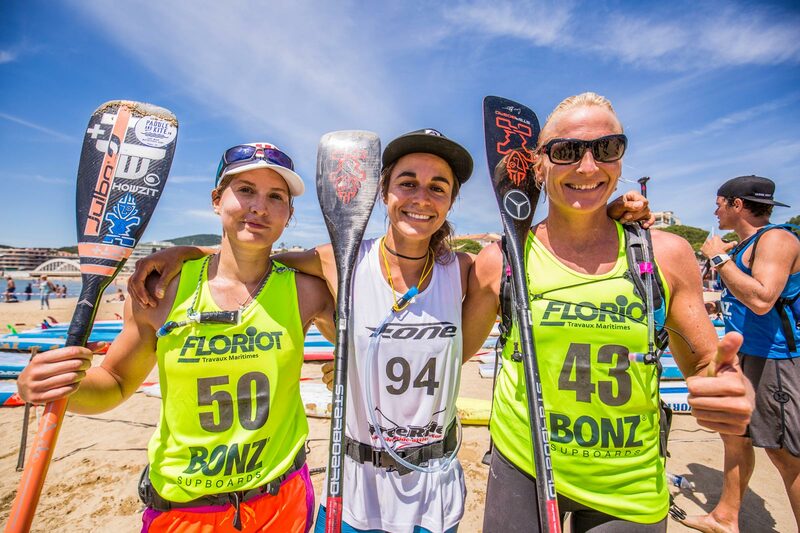 Given the time gaps she already had to make up over the two leaders following her third place finish yesterday, the veteran decided to play it smart and stuck with a pack of three other very strong women – the highly, highly under rated Amandine Chazot (Starboard/France), Susak Molinero (RRD/Spain) and ISA bronze medalist Laura Quetglas (Starboard/Spain) – in order to defend her place on the overall event leaderboard. The move paid off, with the quartet sticking together all the way to the finish, where an extremely impressive Amandine sprinted side-by-side with Candice for a third-place photo finish (I believe Amandine may have gotten it by a nose), with Susak outlasting her main Spanish rival, Laura, to secure 5th place today. The performance of Amandine, Susak and Laura highlights the growing depth of talent on the women’s scene in Europe. While the Continent has produced dozens and dozens of international-level men’s paddlers for years, it’s great to see the top regional women now rubbing shoulders with the world’s best. Laura, who manages a fantastic junior training squad on the Mediterranean island of Mallorca (SUP Racer’s second home) that’s producing some of the best young talent in Europe, was rewarded for her consistency with a 4th place overall finish this weekend. Another name to add to that list is unheralded Dutchwoman Petronella van Malsen, who came home 7th today after finishing 5th yesterday. 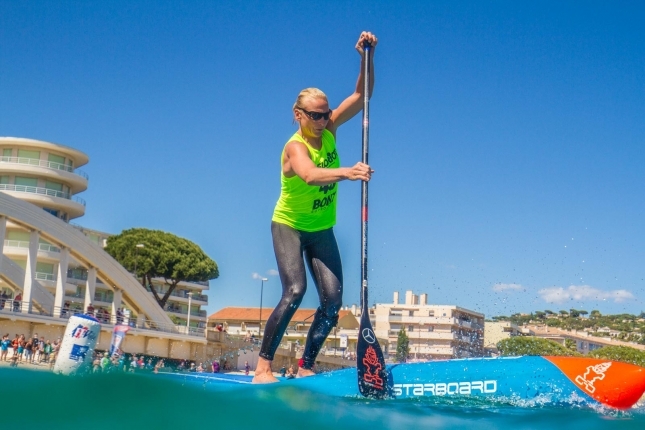 Petronella paddles for the fast-growing Mistral team, who have signed several regional stars within Europe and will be looking to make an impact throughout the European Summer of SUP. Mistral also features one of this weekend’s top juniors, James van Drunen, while their star Tahitians Rete Ebb and Steeve Teihotaata will arrive in Europe in a few weeks’ time. Speaking of juniors, it was an absolutely stellar effort this weekend from young Frenchman Tom Auber, who claimed the under 18’s title and only narrowly missed an overall top 10 spot against the big guns (he was 11th in the elite field). Tom finished ahead of compatriot Martin Vitry and van Drunen on the overall junior leaderboard. In the junior women’s it was hometown hero Melanie Lefanetre taking the overall ahead of fellow young guns Cyara Palenzuela and Ines Blatge. From here, the EuroTour heads across to the west coast of France for the Hossegor Paddle Games, where hopefully we’ll enjoy some waves! Until then here are the top overall finishers, with full results to be posted in the next hour or two. Below that you can watch a full replay of our Facebook Live stream with Mat from TotalSUP. Thanks for tuning in again today–we’ll have live streams every week for the next month and a half as the European Summer of SUP heats up. 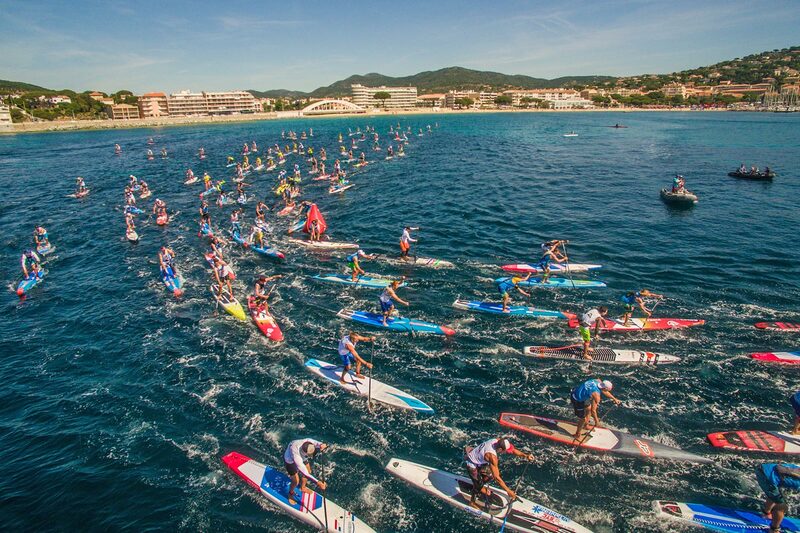 Merci beaucoup to Yannick Pinaud and the local crew from La Cigale Surf Club here in Sainte-Maxime for once again hosting a great event (this is the 8th annual edition of the SUP Race Cup), and a big thanks to the EuroTour crew for pulling it all together. More photos of the weekend over on TotalSUP’s Facebook page. 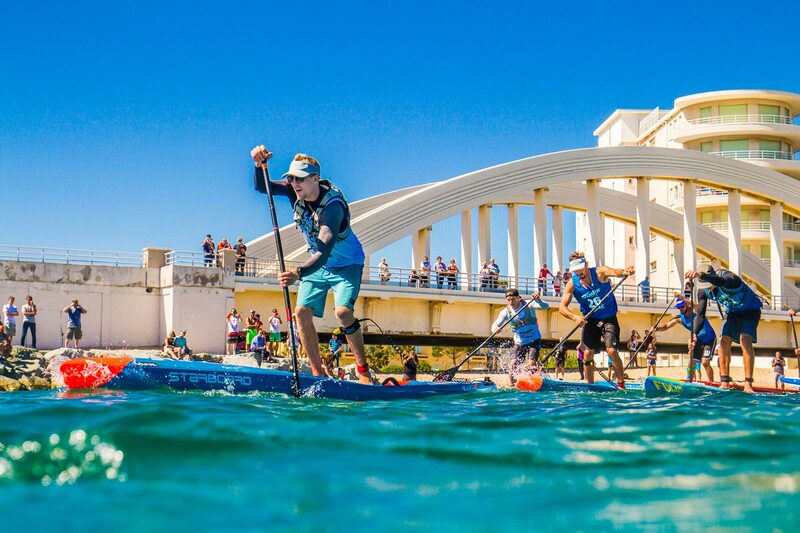 The 2017 SUP Race Cup scored 42.5% on the men’s Race Index and 37% on the women’s, which will have a significant impact on both the World Rankings and of course the EuroTour Leaderboard. We’ll update the standings on Monday morning. But right now: time for a glass of rosé and another croissant. In brief: Carolina Cup hero Titouan Puyo has drawn first blood in week 3 of the EuroTour, narrowly winning the Beach Race on day 1 of the SUP Race Cup here in sunny but extremely windy St. Maxime, France. Titou saluted for Team NSP after a sprint to the beach with world number one Connor Baxter, while Michael Booth was about 10 seconds further adrift after falling at the final buoy and losing touch with the leaders. Starboard made it three of the top four after a strong 4th place from Bruno Hasulyo, while Infinity Speed Freak Slater Trout was impressive in 5th just ahead of Arthur Arutkin and his fellow Frenchman Martin Vitry. After an intense start that saw a chaotic pile-up on the first buoy, the field was soon whittled down as the wind and endless buoy turns broke up the draft trains. First it was a race of seven in the men’s before the top four guys broke away to battle for the win. Titou was simply too good in the end though, and despite some confusion at the finish line – Connor and Titou ran separate ways around a small chicane fence at the finish, however no race official could say which was the correct route and it made no difference to the result anyway, so the issue went no further – the superstar from the French island of New Caledonia will take a slight advantage into tomorrow’s distance race, where Connor, Boothy and the other contenders will have to break him in order to secure the overall SUP Race Cup title that’s based on combined times from the 7km beach race and 18km distance race. Boothy will fancy his chances at the overall title considering he’s only got 16 seconds to make up on Titou, however the Frenchman is looking so sharp right now that I wouldn’t be shocked if he makes it a clean sweep of the weekend. Sunday’s wind forecast is mercifully calling for calm conditions, so it should be a long, hot, grinding race out there in the morning. Apart from the battle of the “big three,” one of the other big stories from today’s race is the performance of the juniors. Martin Vitry and Tom Auber cracked the top 10 for the host nation, while fellow names-to-watch Pau Ybarra (the freshly-minted Spanish champion) and James van Drunen were also impressive as they rubbed shoulders with the world’s best. In the women’s it was Sonni Honscheid all the way, with the German powerhouse breaking the field early and paddling well clear to beat her Starboard team mate. The highly under-rated Frenchwoman Olivia Piana was runner-up, and despite being two minutes behind Sonni (which proved just how good the German was today), Olivia showed once again that she’s one of the most under-rated paddlers on the planet. Infinity’s Candice Appleby was another two minutes back as the brutal headwind/sidewind/downwind conditions scattered the field and produced big time gaps on the results sheet, however the world number three is still looking good for the overall podium and will be hoping to at least reel in Olivia on the overall time sheet. But I don’t think anybody is catching Sonni this weekend. She’s looking way too strong. Starboard went on to make it three of the top four in both the men’s and women’s after the Spanish dark horse Laura Quetglas (bronze medalist at the Worlds in Fiji) crossed just ahead of Mistral’s absolute gun of a dark horse Petronella van Malsen (runner-up at last year’s 11 City Tour and clearly a name to watch this summer). Rankings: The 2017 SUP Race Cup will score 43% on the men’s Race Index and 37% on the women’s, meaning this weekend’s results will have a big impact on both the World Rankings and the EuroTour Leaderboard. After our warm-up session on the microphone today (thanks for your patience at the start there–our mobile internet was on island time), we’ll be going all in on tomorrow’s Facebook Live stream when we team up with the TotalSUP crew to bring you a bi-lingual broadcast. Tune in for the distance race over on our Facebook page in the morning.